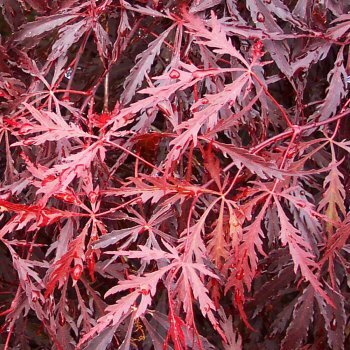 This small, spreading Japanese Maple has beautiful, cascading purple/red burgundy lacy leaves, with the colour lasting from spring right through to autumn. Autumn brings a new vibrancy as the leaves adopt striking shades of bright, fiery reds. 'Tamukeyama' is a mound forming Acer that will grow to a height and spread of 2.5 x 4 metres in 20 years, making a beautiful small tree. Acer palmatum dissectum 'Tamukeyama' is suited to a moist, well-drained soil and sheltered position, preferably in dappled shade. Planted in acid soils, the leaf colour will be at its best although lime can also be tolerated. In addition to our usual range of Japanese Acer sizes, we oofer this variety as a more mature specimen tree with a clear stem of 90cm. This makes a wonderful feature for displaying in the centre of a lawn, or a border or in a large container. Pot grown Tamukeyama Japanese Maples can be planted at any time of the year. Firstly, remove all weeds and grass within a metre of your desired planting hole then dig a square hole as deep as your root mass and approximately 2x as wide. To help your tree establish more effectively, we advise sprinkling root grow in the hole, especially if you have poor soil.